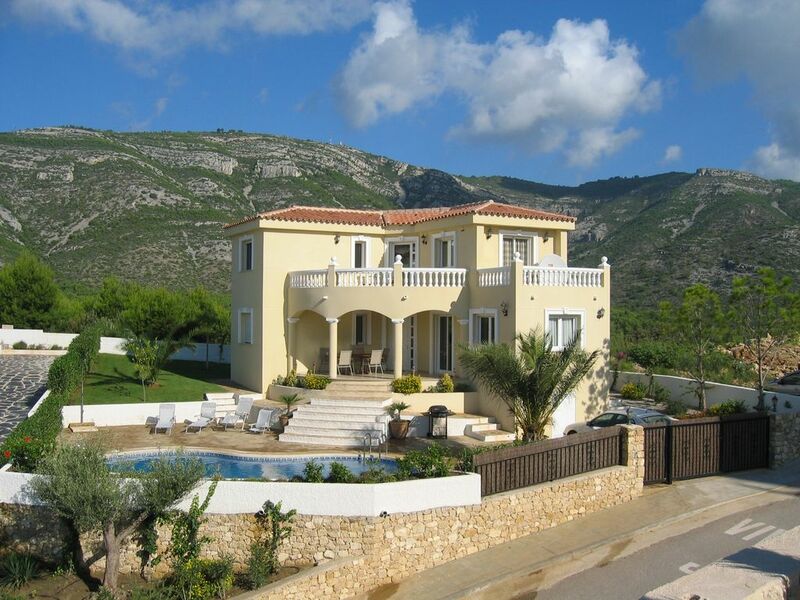 Individually designed beautifully furnished 3 bedroom 3 bathroom detached villa standing in its own grounds. The villa is elevated on a hillside overlooking the Harbour and picturesque villages of Las Fuentas and Alcossebre with its 5 blue flag beaches, shops and restaurants. Fabulous 9 metre pool and terraces set in landscaped gardens creating option for sun and shade as required. Downstairs covered terrace with dining furniture to seat 8 and views over pool and out across the villages and marina. 2 upstairs open terraces with bistro tables and chairs ideal for breakfast breathtaking views to include pine forests, early morning and all day sun. The benefit of flying to this area is the availability of return flights for £50 per person, if booked early, the owners can give further details. Pool heating is at an additional cost based purely on oil usage. 3 bathrooms 1 Bathroom ensuite. 2 Shower rooms both en-suite. Modern open plan lounge and dining area beautifully furnished and leading out to covered terrace and pool. WIFI, Satellite TV, DVD and CD/Radio/Cassette player and toys/games provided. Breakfast Bar and stools, cooker, hob, dishwasher, washing machine, fridge/freezer, microwave, kettle and toaster. Approximately 90 minutes drive to Spanish Ski Resort at Valdinares. Two 18 hole golf courses within approx 30 minutes drive one is the renowned Bernhard Langer Panoramica Golf Course. Notes on accommodation: Ceiling fans and the natural airflow of this property make even the height of summer nights bearable without the need for air-conditioning, windows are fitted fly screens to keep out mosquitoes. Fantastic for a family holiday, unsuitable for wheelchair access, no pets and no smoking in the property please. Outside: Landscaped gardens including all year round colour and lawned area for outside games. Poolside terraces, sun loungers and associated outside furniture. Cleaning / Towels / Linen / Maid service: All bedding and bathroom towels provided and cleaning between lets. Other: Basement storage area, portable gas BBQ, 6 deckchairs/loungers, sun umbrellas and cool boxes. we walked down to the harbour and along the seafront, stopped at one of the numerous bars for a drink and tapas, did a bit of shopping and walked back it was very busy and a lovely atmosphere. We visited Valencia for the day and wondered round, the old and new parts of the city, we had previously booked Verticai which is a Michelin Star restaurant. We stayed in this beautiful Villa as a family of 6 for our summer hols. Even though there were 6 of us it never felt cramped and there was more than enough space inside and out for the kids to spread out and do what kids do. It was really hot but being quite high up on a hillside not only gives great views but a nice breeze. And even when the breeze wasn't enough, the pool was fantastic to dip into. Again, easily big enough for us all to be in there at once having games of volleyball!! Great restaurants in the town and amazing beaches. The owner very helpful and provided great info about local eateries and things to do. Would definitely recommend this villa. Very spacious and well equipped and maintained villa. Amazing view over alcossebre. Great pool area. Owner very helpful and provided informative information on restaurants and local amenities. Highly recommended. The views from the pool and outside eating area are breathtaking. Great location in Alcossebre, away from the hustle and bustle but still a short drive from the beach and shops/restaurants. The villa itself was very well appointed with everything you would need. We travelled with kids of a range of ages and they all enjoyed it. We managed to toddler-proof the stairway without too much difficulty but you do need to take care with young children outside due to stone steps and pool. Teenagers were happy with wifi although you require a pay as you go voucher you can purchase at a local store - worked fine for the week for 10 euros. Overall a great family holiday location! We have just spent two weeks at this lovely villa. The villa was spotless when we arrived and the views from it are spectacular. The villa has everything that a family needs on holiday and it is in a lovely peaceful location. It is a 5 minute drive from all the amenities, bars and restaurants of Las Fuentes and Alcobrosee which are two lovely small towns. We would definitely recommend this villa for the perfect relaxing holiday. My family and I have just returned from a weeks holiday at this lovely villa. With stunning views of the sea and coastline, and very well furnished it was a perfect place to unwind. Close enough to the town for ease of access(a two minute drive) but far enough away for peace and quiet. We would be happy to recommend to anyone, and found the owners helpful and informative of the local area. 3 minutes drive to nearest beach, further beaches all within 10 minutes. All sandy beaches and blue flag with volley ball and basket ball nets, slides, climbing frames and play areas. Watersports in season, to include pedlos, wind surfing, scuba diving, jet sking and cruises. Valencia airport approx 1 hour. Barcelona approx 2 hour motorway drive. Reus Airport approx 1 hour. A car is essential in our view to fully explore and appreciate this beautiful area of Spain. The Orange Blossom Coast has miles and miles of beautiful beaches, and secret coves. It also has one of the most mountainous regions in Spain, with medieval villages and outstanding landscapes. Places to visit include Morella, a medieval walled town and Peniscola with its old town and famous castle over looking the sea. Port Aventura has a fantastic themed water park and Universal Studios Theme Park. Local shops provide an ample selection of quality produce with super and hypermarkets at nearby Benicarlo and Vinaros approx 20 and 30 mins drive repectively. An abundance of local restaurants, cafe and Tapas bars, provide a wide range of good quality food to suit all tastes.